At Think Ford, we know that each business has its own requirements for commercial vehicles, which is why we offer a number of Ford Transit Conversions. The Ford Transit One-Stop Shop Commercial range offers a whole range of cab sizes, load spaces and payloads. Whatever your commercial needs are, there is a model to suit you. It is the ideal platform for a chassis that can be adapted simply and quickly. Discover more at your local Think Ford dealership in Berkshire, Hampshire and Surrey. Discover all the latest Ford Transit Conversions offers currently available. Download the latest Transit Conversions brochure. Working days are made easier with the Ford Transit Tipper. Combining functionality with an intelligent design and a durable construction, the Transit Tipper is a reliable commercial vehicle that is made to cope with even the most adverse site conditions. Change the way you work thanks to the Tipper’s ability to handle a wide range of payloads. Benefit from the sequences hydraulic body hold down, an automatic system that secures the body in its lowered position without the need for attention from an operator. Featuring a dual mode hinged tailboard, both the top-hinged and tip-thru operation modes are controlled by a side-mounted remote lever. Conveniently located next to the driver’s seat, the Tipper’s Control Station allows you to take control of all its features with ease. Offering the ultimate versatility, the Ford Transit 3-Way Tipper can tip left, right and to the rear for access in even the most restricted of sites. Both robust and reliable, the 3-Way Tipper is a versatile addition to any company that is designed to deliver anywhere. Rest assured that you are in full control when side-tipping thanks to the remote wander lead handset, which plugs into the socket below the driver’s seat. The dual mode hinged tailboard uses the side-mounted remote lever for a top-hinged operation or the pillar latches for a bottom-hinged operation. Featuring a 5-stage chromium plated ram complete with shock absorbers and electrical limit switches, you are in full control of the tipping angle. Making light work of drop-offs, the Ford Transit Dropside is ideal for creating a cost-effective and professional image for your business. 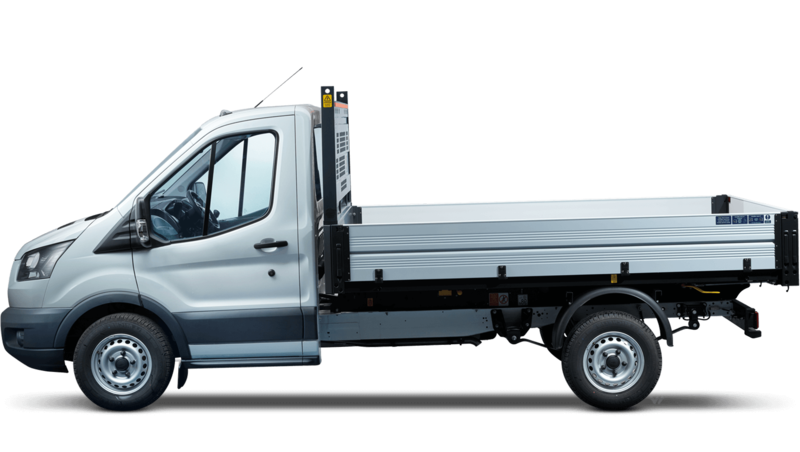 Available with a single or double cab with body lengths from 2.85m to an impressive 4.06m, the Transit Dropside is designed to suit most operating needs. Whether you opt for front-wheel drive or rear-wheel drive, you can benefit from a whole range of features. With unparalleled load access and innovative features to help make everyday tasks that bit easier, the Transit Curtain Slider has sliding, semi-rigid curtains for easy pallet access. A perfect solution for larger loads, the Ford Transit Luton / Box Van is designed to handle the heaviest of payloads. Ready to go the extra mile, it’s nimble and durable enough to cope with multi-drop distribution. In the event that the shutter is accidentally closed while someone is in the load space, an emergency door override allows you to open the shutter from within. With a generous load space and a comfortable cab, the Transit Luton / Box Van is full of convenient features that are designed to make your work easier. Equip your business with the right commercial vehicle for you. Visit your local Think Ford dealership to speak to a member of our friendly, expert team to discuss what conversion is best for you. We are here to help you get the most out of your commercial vehicle, no matter what your needs are.